Sony is the latest in a long line of TV manufacturers to pledge allegiance to saving the world, with its new Eco TV WE5 Bravia range. Billed as the 'greenest-ever Bravia', the Full HD LCD screens consumes over 50 per cent less power than their predecessors. How do Sony manage this, we hear you cry? Well, it has something to do with an innovative backlight display – the energy efficient micro-tubular Hot Cathode Fluorescent Lamp (HCFL). A cool, new feature of the TV is Picture Off mode. To save energy further, the TV will detect if there is no one in the room – something to with body temperature – and switch into standby mode if the place is empty. The WE5 series may be kinder to the environment but it doesn't seem to have scrimped on features. The sets use Bravia Engine 3 for picture quality, Motionflow 100Hz technology combats image blur and makes what you are watching that little bit smoother. Speaking about the line-up's eco benefits, Christian Brown, Senior Product Manager, Sony UK, said: "It's an emphatic statement that Sony is serious about cutting the environmental footprint of everybody's home entertainment experience." 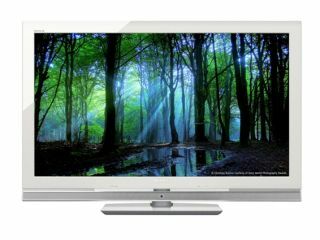 The WE5 series is available in 40-inch and 46-inch screen sizes and will be out in Spring, with prices to be announced.